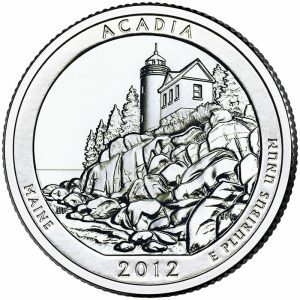 The United States Mint released images of the 2012 America the Beautiful Quarters on Thursday, and lower prices for related products were published on Friday. America the Beautiful Quarters include five new coins featuring reverse designs emblematic of selected sites of national interest. The five sites to be honored in 2012 include El Yunque National Forest of Puerto Rico, Chaco Culture National Historical Park of New Mexico, Acadia National Park of Maine, Hawaii Volcanoes National Park of Hawaii and Denali National Park of Alaska. Released into general circulation throughout the year (see quarter release dates), these quarters are also featured in several numismatic or collector products. The United States Mint plans to lower prices on at five three of these. Those five are shown in the chart below along with the new prices. *Update: The 100-Coin Bag was added to the above price-cutting table on January 11 following a Mint announcement of further product reductions. **Update 2: The rolls were added to the pricing table on January 23 following a publication on the Federal Register by the Mint. The new prices are significantly lower than previous releases which will likely make them much more appealing to collectors. As mentioned, the United States Mint also released images of the upcoming quarters. These images show greater detail than the line-art imagery that has been available since early December when the Mint first announced the quarter designs. The images follow. 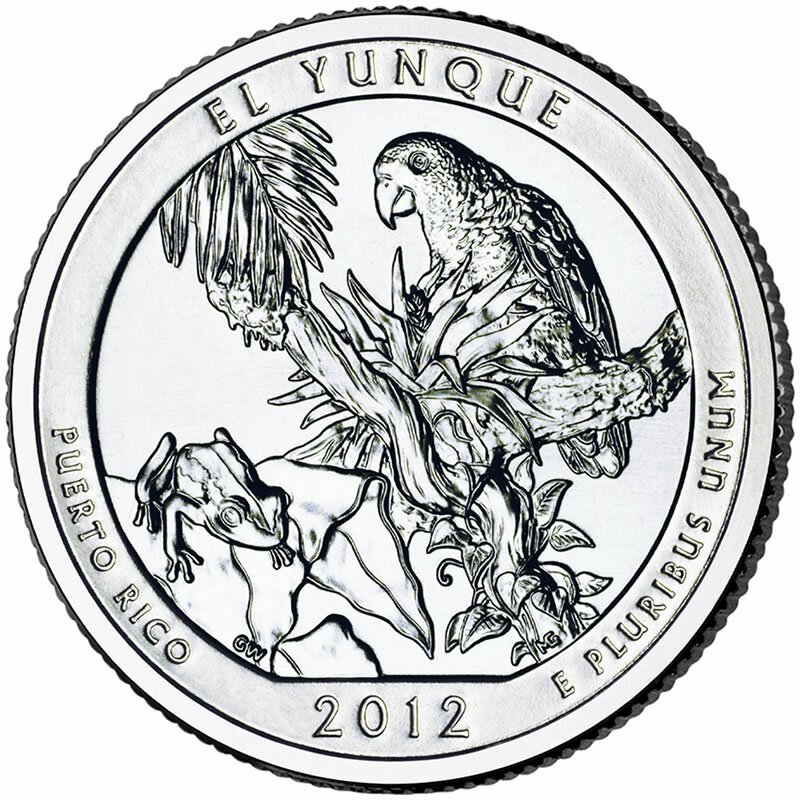 The reverse of the El Yunque quarter showcases a Coqui tree frog along with a Puerto Rican parrot nestled in the dense foliage of the forest. Reverse inscriptions will include EL YUNQUE, PUERTO RICO, 2012 and E PLURIBUS UNUM. This design is the work of United States Mint Artistic Infusion Program (AIP) Master Designer Gary Whitley and was sculpted by United States Mint Sculptor-Engraver Michael Gaudioso. 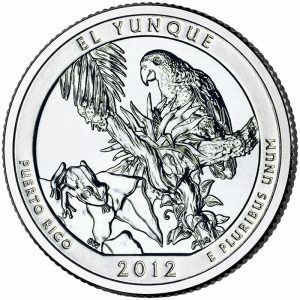 The release date for the El Yunque coin is expected to be on January 23. Shown on the reverse of the Chaco Culture quarter is a design including two elevated kivas that are part of the Chetro Ketl Complex with the north wall of Chetro Ketl and the north wall of the canyon also shown. Included inscriptions are CHACO CULTURE, NEW MEXICO, 2012 and E PLURIBUS UNUM. The reverse was designed by AIP Master Designer Donna Weaver and sculpted by United States Mint Sculptor-Engraver Phebe Hemphill. 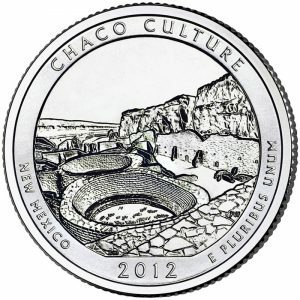 The release date for the Chaco Culture coin is expected to be on April 2. The Acadia quarter shows the rugged Atlantic coastline of the park along with Bass Harbor Head Lighthouse. 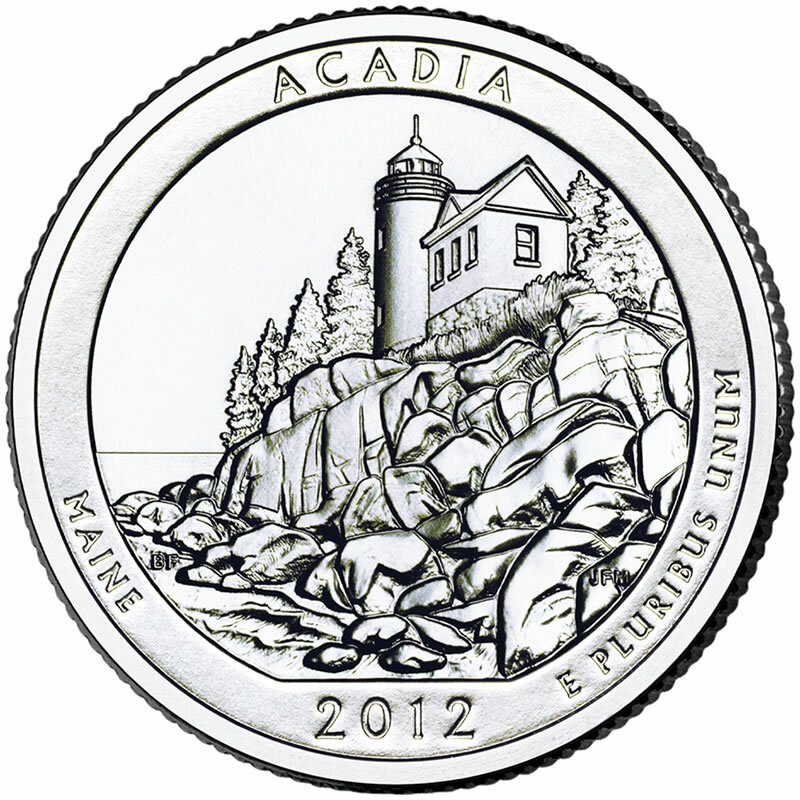 Reverse inscriptions on the strike include ACADIA, MAINE, 2012 and E PLURIBUS UNUM. According to the Mint, this reverse was designed by AIP Associate Designer Barbara Fox and sculpted by United States Mint Sculptor-Engraver Joseph Menna. The release date for the Acadia coin is expected to be on June 11. 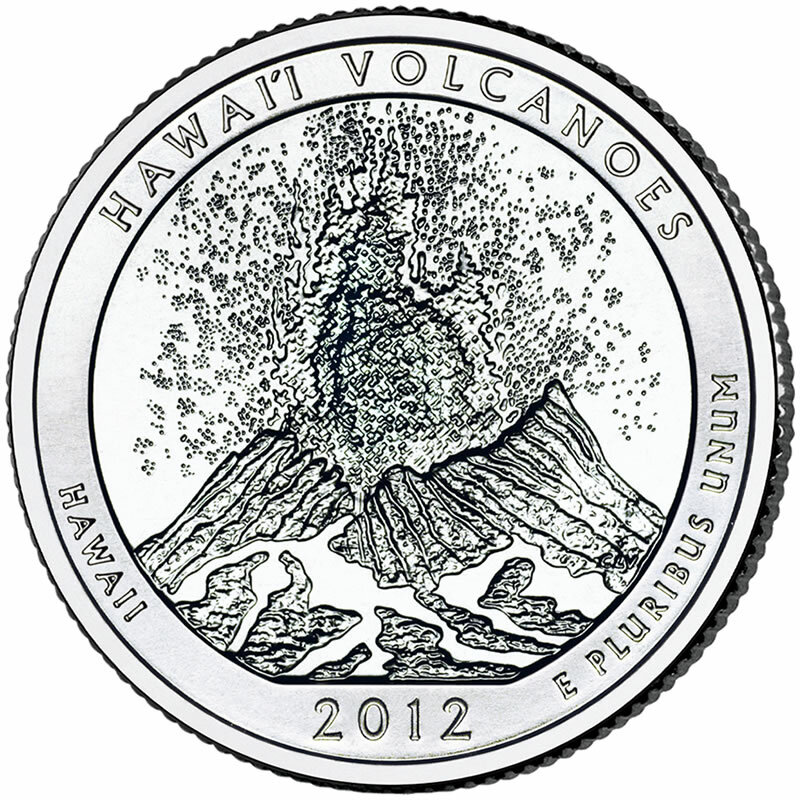 An erupting Kilauea Volcano is shown on the reverse of the Hawaii Volcanoes quarter. Along with the eruption from the east rift of the volcano, the reverse also includes the inscriptions of HAWAI’I VOLCANOES, HAWAII, 2012 and E PLURIBUS UNUM. The reverse was designed and sculpted by United States Mint Sculptor-Engraver Charles L. Vickers. 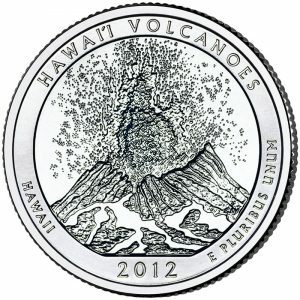 The release date for the Hawaii Volcanoes coin is expected to be on August 27. 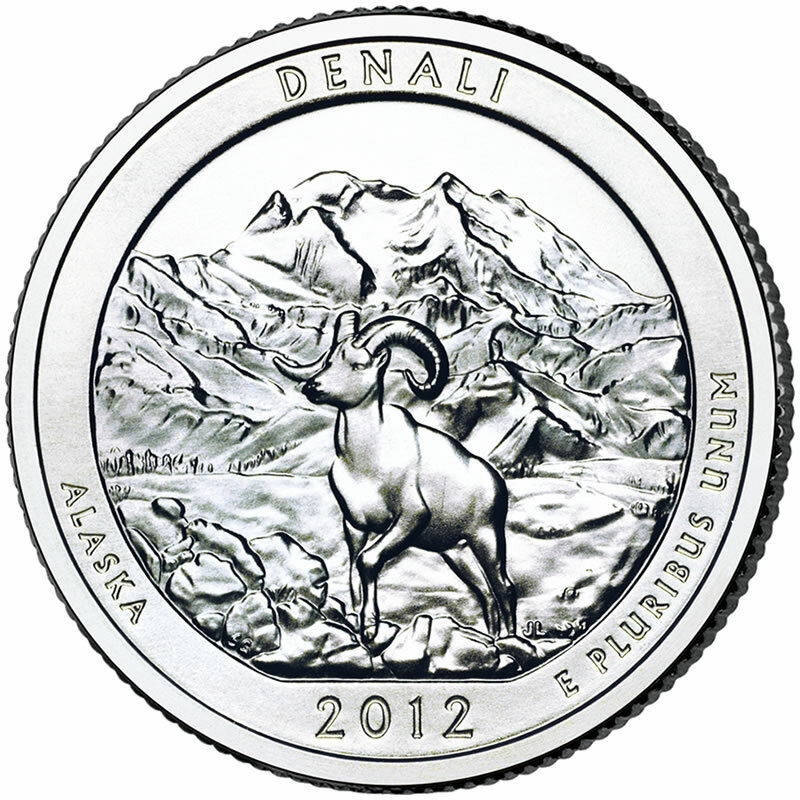 Mount McKinley is shown prominently on the reverse of the Denali quarter along with a Dall Sheep. Reverse inscriptions include DENALI, ALASKA, 2012 and E PLURIBUS UNUM. The reverse was designed by AIP Master Designer Susan Gamble and sculpted by United States Mint Sculptor-Engraver Jim Licaretz. 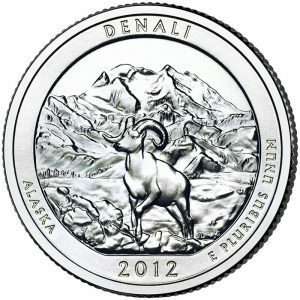 The release date for the Denali coin is expected to be on November 5. The obverse of all America the Beautiful Quarters contain the John Flanagan portrait of George Washington seen on quarters with small variations since 1932. Additionally, the United States Mint also uses these same obverse and reverse designs for its related investment-grade America the Beautiful Silver Bullion Coins™ and collector America the Beautiful Five Ounce Silver Uncirculated Coins. Keep those price cuts coming US MINT…!! Funny how reducing prices usually leads to improved sales figures. And just look at that Denali Coin! What a beauty..!! Acadia too…!! Wait until those come out in the 5oz size…!! i hope the cut the price on the rolls and the mint sets. otherwise, this three coin, circ and uncirc is just repetitive nonsense. I found the Chaco Culture one counting coins for my dad. Woo-hoo!